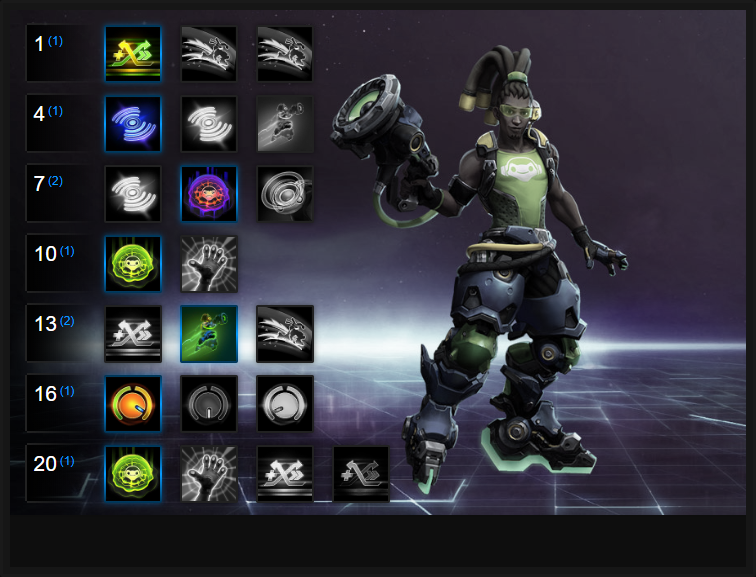 In this Lucio Build Guide, we provide an overview of his strengths, abilities, talents and matchups. Lucio is a highly mobile, utility Support Hero that brings an invaluable kit. Not only can he increase the movement speed of his team, but he can also passively heal them continually. Alongside this he can knock enemies away, shield all his team or utilise his music to harm opponents. What's particularly interesting about Lucio is that his kit combined, when you also factor in his Trait (see below), makes him a formidable ally to have. The fact his healing doesn't consume mana, or the fact he can freely and rapidly switch between that and movement speed ensures any team he is with are difficult to bring down. Not only this, but when he combines this with Amp It Up, it's a level of support that rival's Rehgar and Malfurion by some margin. In the right hands Lucio is not only difficult to kill, but he ensures that his team have a fighting prescence I've not seen before and if paired with Heroes such as Zarya, he can comfortably carry. Wall Ride - I have to admit that Wall Ride is a strange Trait and while it's perfect for Lucio in regards to his Overwatch kit, it needs a lot of practice to gain success with. Gaining continued combat value with can, at times, prove challenging as it depends on the Battleground you're on; there simply isn't always the scenary that you need. However, on large and expansive maps the speed boost can unquestionably help, especially when stacking it with with Crossfade and if you can maintain contact with a wall. If you can't, the trait becomes largely redundant baring intermitent uses. Clicking too close to a wall can result in Lucio failing to go in the direction you want, while clicking too far will see him drop off. To also maintain contact and turn corners (when possible) you need to be extra careful. Despite these small niggles, the fact your 20% speed boost is maintained after falling away from scenary ensures even without Crossfade (Speed Boost) you can keep some movement speed just by tagging a wall for the briefest of moments. Push Off (D) - Providing Lucio with some much needed crowd control outside of Soundwave, Push Off allows him to slow targets when hit. Effectively, it's a small leap from a wall you're Wall Riding, to a chosen target. For a quick peel on an ally who's under pressure, it's great. Sound Wave (Q) - As your defensive ability, Sound Wave has a very short range and with a 7 second cooldown, it's relatively easy to have available at all times. Despite its range, it's your only means of preventing players from reaching you or an ally. Key to its use isn't just about saving it for yourself, but also peeling for an ally or buying time to lock down an enemy player. What's particularly interesting about Sound Wave is upon use, enemies actually face away from you buying you and your team even more time to escape. If you can, it's also worth swapping to Crossfade (speed) for a quick retreat. Crossfade (W) - An incredibly powerful ability, Crossfade allows Lucio to use two music tracks. The first grants a speed boost of 10% to all allies near Lucio. The second, by activating Crossfade again, grants AOE healing. What's particularly interesting ability this ability is not only the healing being high and continuous, but the fact it has no cooldown or mana requirements. Key to its use is knowing when to heal and when to grant movement speed and during the course of any fight, rotating between them both regularly. Amp It Up (E) - Working exactly the same as in Overwatch, Amp It Up boosts the output of your Crossfade, depending on which song you have active at the time. The bonuses are significant, with your movement speed boosted to 35% and your healing output significantly increased (multiplied by around 5 times the original value). Unsurprisingly Amp It Up has a lengthy cooldown of 13 seconds and a mana cost of 90, making it particularly expensive. If you can, I'd probably push towards a greater use of Amp It Up when Crossfade (healing) is active, as the output is enormous. Amp It Up on movement speed is best used when escaping. Sound Barrier (Heroic) - Without doubt his best Heroic, Sound Barrier provides an enormous AOE shield to anyone around Lucio after one second. At a cost of 100, similarly to Amp It Up it's expensive. However, it's absolutely worth it for such an enormous amount of shielding. Best of all, you can follow up Sound Barrier with an Amped Crossfade (healing) for a ridiculous amount of sustain. High Five (Heroic) - Your only means of a burst heal, and Unstoppable, High Five has a low cooldown and allows Lucio to protect one ally in a pinch. With a short cooldown of 15 seconds PER ally, you can effectively ping through your team repeatedly, at no mana cost. It's awesome. Party Mix allows Lucio to increase the range of Crossfade by 20% if he remains next to allies for 8 minutes while his tracks play. It's incredibly easy to complete as multiple heroes in your radius increase the quest. The extended range also ensures you can look after your team even if they over extend. Variable: Lucio can maintain his Wall Ride bonus when he leaves terrain or a structure. The bonus lasts for several seconds, so gaining a potential of 40% increased movement speed from Accelerando is significant. Not only does it allow you to not rely on Crossfade (Speed Boost) but pretty much ensures you can zip around the Battleground at all times. Subwoofer allows Lucio to boost the knockback range of Soundwave by 75%, it's also a quest talent allowing him to increase its arc size and range significantly, if he hits 3 Heroes at once. Great for peeling for your team. His old Heroic becomes a Talent, with Reverse Amp allowing his heal to damage enemies, and his speed boost to slow them. Finally he has utility in a fight. Providing an incredible amount of shielding every 80 seconds, Sound Barrier is a no-brainer. Offering 1200 shielding is incredible and despite the 1 second cast, is usually very easy for Lucio to cast. Variable: Grab High Five if against a CC heavy team, or one that's dealing sporadic burst damage where you need the constant healing. Heavy Casters allows Lucio to stun enemies he hits from Wall Ride > Push Off, allowing for even greater crowd control/peel potential. Rejuvenescência boosts the healing output of Crossfade (Healing Boost) by 2.5% of a players maximum health, per tick. That's an incredible amount of rapid healing that offers Lucio and his team amazing amounts of sustain. Bossa Nova allows Lucio to reduce his heroic cooldown by 30 seconds and for that, he simply loses 2 seconds off the shield duration. I think that's a solid trade-off for more team fight shielding. Variable: If you took High Five, take Mixing Fire here. It allows your High Five to be used on enemies, while also reducing the healing they receive by 50%. This list of tips and tricks are just a handful of things we think will help your Lucio play. We'll continue to add to the list as required and if you have any tips you'd like to share, let us know in the comments below and we'll place them here. 1. You should regularly be changing your Crossfade. In simple terms, speed for movement and getting from A to B, or escaping when needed. Crossfade (healing) for any team fight or when taking camps or a boss. 2. You have lots of mobility as Lucio so you don't always need to use Soundwave to defend yourself. Don't be worried about using it to move an enemy player out of position or to peel for an ally. 3. Careful use of Amp It Up is key to Lucio's play. Expecting heavy damage? Use it during Crossfade (healing). Need to retreat or chase down enemies quickly? Use it during Speed Boost. 4. It's difficult to use Lucio's trait but practice does pay off with it. With Speed Boost (amped) while wall running, you can cover the map incredibly quickly. 5. Lucio automatically attacks the nearest target and can move while firing. Use this to harrass immobile Heroes such as Leoric or Dehaka. 6. Try to predict when enemies will burst your team so that you can use Sound Barrier. It takes 1 second to cast and for the shield to appear and you can be stunned before it is cast. 7. Your only burst healing is using Amp It Up with Healing Boost active (from Crossfade). It rapidly heals, but still remains a heal over time. 8. It's sometimes worth fighting in close quarters with Lucio as you can still escape if you need to (using scenary) but also because it guarantees you can maintain contact with your buffs to all your allies, while still being able to deal damage with your basic attacks. 9. I've found Zarya to pair amazingly well with Lucio simply because the additional shielding and your constant healing output helps to sustain a team so easily. Zul'jin is also excellent with Lucio thanks to the constant healing over time. 10. Lucio is incredibly vulnerable to stuns, despite his mobility. With no ability to Cleanse them, he has to rely on clever healing and knockbacks to protect his team mates.